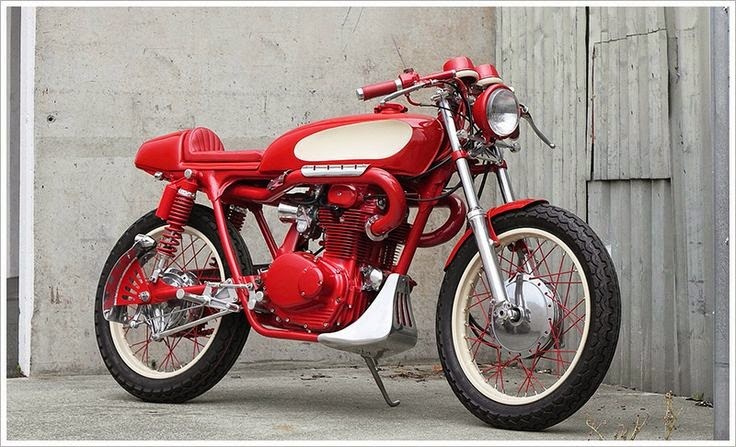 Indeed many café racer ideas that could be applied on the Honda CB350 that have been circulating on the streets. 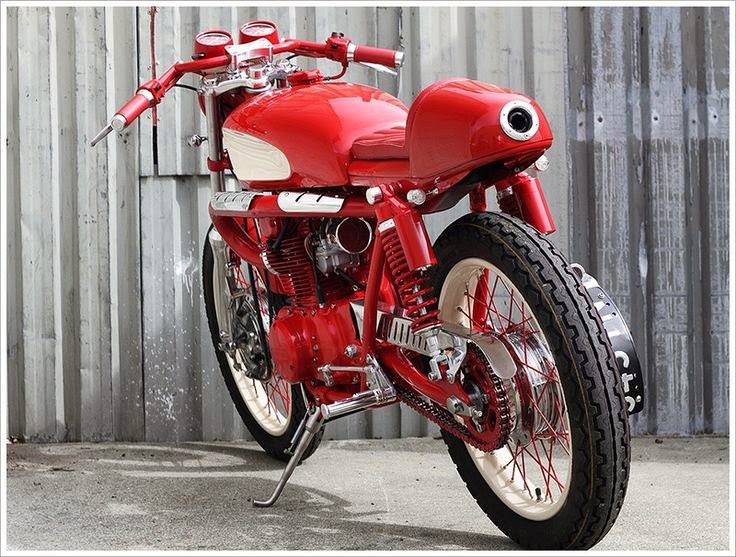 And if you currently do not have an idea to modify your favorite motorcycle? Relax, you're not alone. 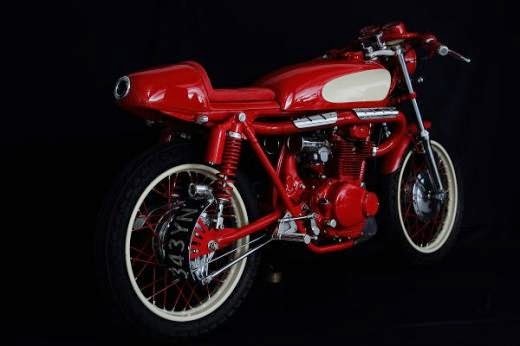 Just as the owner of the 1974 Honda CB350 who then choose to let Ron Smith apply his creative ideas on the motorcycle. However, the crew of one of renowned modification houses in the New Zealand, The Pacific Motorcyle Co. want this motorcycle to be different and unique. He wanted the motorcycle was look with the dominant color red, so it was the original concept. Then another inspiration came from the 1950s Chevy Corvette that has a characterized the wing and door. That's why later he gave the name to his work the 'Red Rocker'. So the first step is to remodel the chassis and then design the gas tank. The fuel container is cut into two parts and extended up to 6 inches. Once reconnected, on the side then given additional steel panels with the style of the Corvette Stingray. Although the tank is extended, but its capacity remains the same as a standard tank. The remaining space is then used into the abode of the lithium battery. 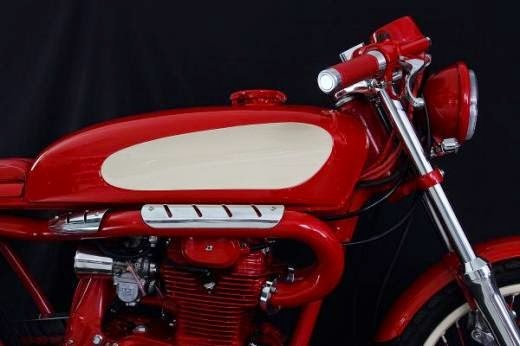 Because the red color has been set as the modification theme, it is no wonder if this color comes to dominate the look of Pacific's Honda CB350 works. Starting from the frame, engine block, swing arm, front fender, house lights, Lossa clubman handlebar, until the leather that wrapped the seat. In order the color is not too flashy, Pacific deliberately incised the white color to the side of the tank and the chorme sparkle in some parts, such as Rolland Sands Design front fork, taillights ring, Topliss Brother Engineering handlebar clamp, chain cover and exhaust heat shield. While the motorcycle engine has undergone some adjustments such as the piston was bore up to adopt the CB750 piston. Another changes also happened on ground camshafts also port & polishing. 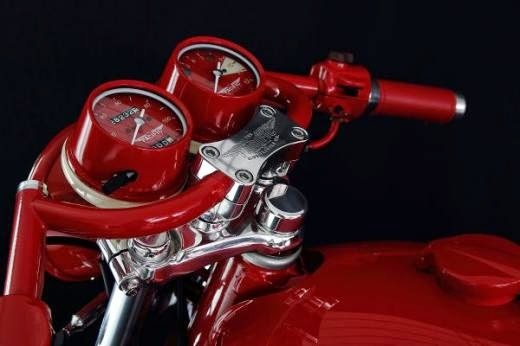 The only remaining of the original devices on this CB350 motorcycle is the speedometer and tachometer. However it has been given a touch of red color with the Pacific logo on it.